A clean environment is a healthy one. The requirements of keeping and maintaining a building are numerous, but a big one is protecting the occupants. Regardless of whom your occupants are, cleanliness is a priority. 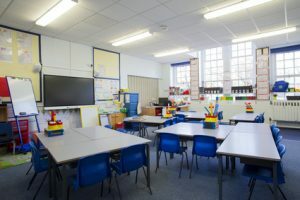 When people share classrooms and facilities it makes sense that their exposure to germs and disease is increased, as well as the spread of illness. Last year there were outbreaks of both Mumps and Noroviruses in schools across America, as well as Measles. If schools want to increase attendance rates, the key is to prevent illness. In many schools, funding is affected by absentee rates. Each year, nearly 60 million school days are lost to sicknesses, like the cold or flu, according to the CDC. The importance of an infection control program in schools is huge. The best way to create a positive effect on student learning is to clean with health in mind. Another thing to keep in mind is that reducing indoor pollution, including bacteria, viruses, dust, allergens, molds and fungal spores, will greatly enhance the wellbeing of building occupants. Talk to your salesman or check out our website to learn how you can implement an infection control program today. PreviousPrevious post:Green CleaningNextNext post:Why Control Dilutions?